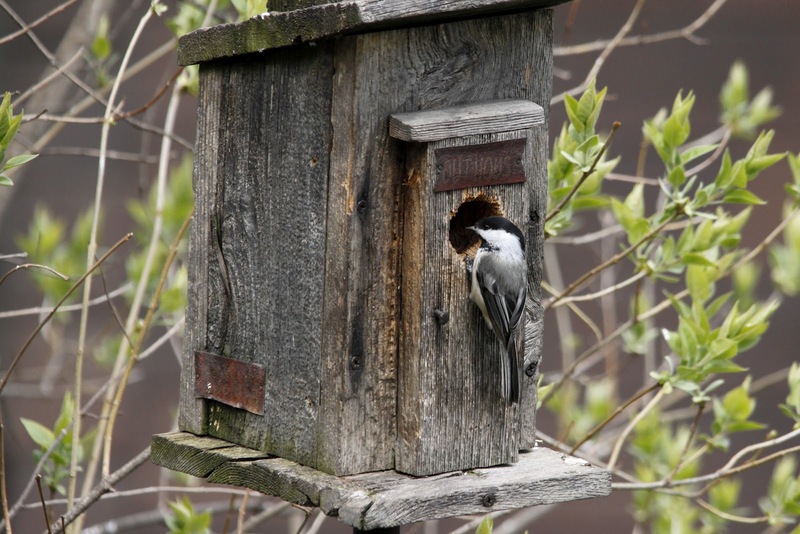 Our decorative "Outhouse" birdhouse has become popular with the Chickadees. I have a soft spot for Chickadee's. They were my "spark bird", meaning the bird that got me hooked on birding many years ago. Rob and I were at a park close to home, and one landed in my hand for a peanut, that was it, my spark moment, and I've been hooked ever since. Even with the many feeders we have out, we didn't have many Chickadee's come to our yard, it was always a great thrill to have one or two show up from time to time. All that changed 3 years ago when a pair moved into our decorative "Outhouse Birdhouse" that Spring. After a few weeks of the pair moving in, we could hear the babies peeping away when we were outside and were very excited about this happening. We went away for one night, just one night, and the babies "fledged", meaning they left the house and went on their way while we were gone. We missed it. We were so disappointed, but happy that the birds had nested in our yard. Ever since then we do have Chickadees in the yard on a more regular basis, and we like to think it's the ones that were hatched here. This year again a pair of Chickadee's nested in the same birdhouse, after fighting with some House Sparrows for it. Rob helped the Chickadee's win the war for the house, and another clutch was hatched. Again, we listened to the little one's growing up inside the box and watched the parents bring food to the little ones constantly. I even had a glimpse of one of the babies peeking his head out of the box on Monday, but Rob was the really lucky one, he saw them fledge yesterday while I was at work. As disappointed as I was that I missed it, I was glad that he was here to see it. He got some great pictures and does a wonderful job of explaining what he witnessed in his own blog, which you can read here. I have a feeling there is going to be even more Chickadees in the yard this winter and that's just fine with us! It is a feeling when even friends and strangers will use your outhouse. Chickadees are like close friends.